Treasures await those who search the sands where beach goers have lost coins and other valuables. See how easy and fun it is to search for these common values. Rumor Investigated: Buried Bags of Silver Dollars...Owner passed away and left something hiding for his heirs??? We check it out. Also, SCUBA dive with a detector for GOLD! Jeff Smith aka ( Smithsgold )and Joey Wilson aka (JWdive )gear up and get into some nice finds in a clear mountain river known for nuggets. All new adventure with all new recoveries. Even non-divers use U/W detectors, there is a lake at the end of my block (boring dive!) 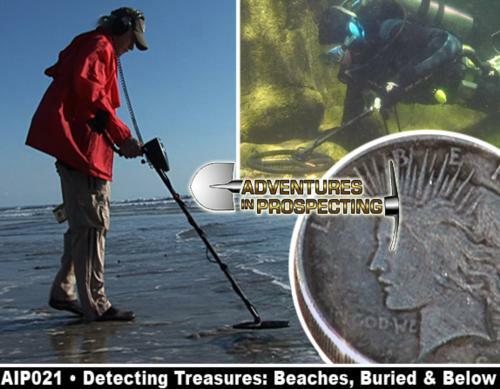 that draws people in hip boots with U/W metal detectors who sweep the beaches and shallows for loose change and jewlery.I know one found a Rolex with a silver dollar band that the owner had asked for the life guard to drain the lake. The kid told him to file that request with the EPA and get back to him. Wanting to go metal detecting - need buddy!